cover art © Guilherme Gustavo Condeixa. Zinc had hung feeders all along the boughs of the trees, mostly cottonwoods and piñons that she could see from the window of the casita where she lived. This way when she needed a break from the work she did at her desk, she could look up—a small window was right there—and drink in the bird life, albeit at some distance. There were greenish-brown hummingbirds and red-brown finches to be seen three seasons of the year. Sometimes there were piñon jays, their blue bodies as vivid as the desert sky overhead. At least once a week she caught sight of the local roadrunner, whom she had named Steven, after someone she had loved once, someone who had broken her heart. And once—mystery of mysteries—a peacock dropped out of the sky, spread its resplendent blue-green feathers, turned its head in the direction of the window behind which Zinc stood with one hand over her open mouth and her eyes brimming with tears of joy, and looked right at her before disappearing into the scrub. Now that was a day to remember. But lately Zinc had begun to wonder what it would be like to work facing the mountains rather than the cottonwoods. In fact her casita did have windows facing east, but the main house, where the old man lived, obscured her view. She wondered what it would be like to work outdoors sometimes, where she might see jack rabbits running in the scrub, or maybe even a lone coyote reigning proud from some rocky outcrop. She mentioned this desire to Smith, the old man's sometimes driver, and Smith said she should get a laptop. Smith told her there was a second-hand computer store on Central. The owner was a real geek, he said; he picked up obsolete models for next to nothing and gave them new life. His prices were extraordinarily reasonable, as if he labored merely for the love of it. For the love of it. Zinc liked that. On a Saturday Zinc walked down the dirt road from her casita to San Dominic Road, and from there she walked to the bus stop on Bonita. She preferred not to talk to strangers if she didn't have to, so she carried with her a Macy's shopping bag into which she'd stuffed the bathrobe she'd removed from her body earlier that morning. It still smelled faintly of the coffee she'd accidentally spilled. When the bus came, she took the seat behind the driver. Then she watched out the window, and sure enough, before long she saw the second-hand computer shop storefront, wedged in between a coffee shop and a new-age gift store that featured a large limestone Buddha in its big front window. She took the bus a mile or so farther and then got off and awaited a return ride. This time she knew where to look and she was able to gather in more information. The computer store was called Timothy's Second-Hand Computers, and what Zinc recognized as a very old Mac model sat in the center of the window—a bookend (in size and positioning if not in eminence) to the Buddha in the shop beside it. The Mac's screen and the innards that should have been behind it had been removed, replaced with a roll of toilet paper, the end sheet of which stuck out from what had once been its floppy drive opening. Timothy had turned the old Mac into a toilet paper dispenser! Zinc could drive of course, and she had a junker to prove it—a seventeen-year-old Pontiac Firebird that her brother, Frankie, had given her two years earlier. But she didn't drive it unless she absolutely had to. Just looking at the orange-red beast with its long raised snout and angry flared nostrils, parked as it was as far from her casita as the old man would allow, seemed like a bad idea. And so the following week, late in the afternoon, she took the bus once again, this time throwing a pair of jeans and a paperback into her Macy's bag, and getting off at the corner just before the second-hand computer store. Then she stood, hidden behind sunglasses with lenses the size of fists, her wild brown curls stuffed beneath a NY Yankees cap, leaning against the stucco wall of the Central Ave Bank, cattycorner from Timothy's, at the point where she could see the door but could not be seen herself, attempting to determine how busy the place got. When she felt quite sure there wasn't much traffic (in fact, the door hadn't opened once), she crossed Central and marched in. A little brass bell on the door announced her arrival, but Timothy, who had his back to her, only mumbled, "How ya doing?" and didn't turn around. The table he worked over was full of computer parts, illuminated by a green goose-necked desk lamp, the bulb of which was close to the table surface. "Fine," she heard herself say. It came out sounding like a child's voice. Well, that was her voice; it was high-pitched and there wasn't much she could do about it. "Can I help you?" he asked, and he looked past her for a second, perhaps searching for the child he thought he'd heard. "I'd like to buy a computer. A laptop. A used laptop. An inexpensive used laptop." She smiled nervously. Timothy was old, perhaps in his mid seventies. But it was only the skin on his face, which fell over his bones like carelessly hung curtain swags, that gave him away. He was trim and—she noted as he got up to round the counter—spry and surefooted. She raised her hand to her sunglasses, but then dropped it just before her fingers made contact. A moment later her hand came up again, and this time the glasses came down with it. Timothy stopped in his progress to stare into her eyes, tipping forward from his waist for the briefest moment. "The laptops are over here," he mumbled, and he turned to show her the way. Timothy spent the next several minutes describing the virtues of each of the four second-hand models he had available. Two were so old they didn't even have modems. "What do you want it for?" he asked, turning toward her suddenly. Zinc swallowed. This is what she hated. The sudden question, the switch in focus, and then the inevitable journey the interrogator always took into her eyes. Years ago, when her skin was smooth and tight, people only said, "What an unusual color your eyes are." But now she was forty-five and there were tiny lines around her eyes, making them somehow more—not less—prominent, or so she felt. Sometimes it seemed as if they were doorways, with doors that strangers could throw open easily and walk on through. Where did they go? What did they do in there all that time? Caught off guard, there was no chance to come up with a lie. And the truth was Zinc was a terrible liar anyway. "I write poetry," she said. "For a living?" asked Timothy, sounding alarmed. "For a living?" This time he chuckled. "For an...a...man." She'd almost said "an old man," how she and Smith referred to him, a term of affection for them. "Part time...the housekeeping. Well, actually, it's more than that. I do other things for him. And then the poetry. I make some money now and then from that too. So if you put the two together...." She realized she was rambling and stopped abruptly. Timothy turned back to the computers. "You're under the radar," he mumbled. "One of those people who can't manage a real job. A lot of you here in Albuquerque." The color came to her face immediately, a flash flood. She loved what she did. She loved her life. Why did everyone assume that if you didn't make much money or didn't do something glamorous, you were a loser? And wasn't he under the radar too, working at rejuvenating dead computers in a store that nobody visited? She squared her shoulders. For the love of it indeed. But all she said was, "No." And then she thought better of it and forced a chuckle. "Well, maybe." "You shouldn't admit it," Timothy said, turning to hand her one of the laptops. She could see in his eyes that he was serious, that he meant well. "If you make your money cleaning house for someone," he expounded, "you should tell people you're a personal assistant. It's almost true if not exactly, and it sounds much better. Saying you keep house...." He shook his head. "People will make assumptions. You'll never get anywhere. You'll clean houses forever." Again he took the journey into her eyes, but this time he returned much sooner. "But then you're not all that young, are you?" Although she wanted nothing more than to escape, she forced her feet to stay planted just where they were, because, second to escaping, she wanted a laptop. And, as Timothy had so kindly pointed out, she wasn't a child anymore; she had learned to control her impulses. Ultimately, she chose the laptop that was least expensive—an old modem-less IBM that Timothy guaranteed would work for the next five years if she was kind to it—and took the bus home. So lost in her thoughts was Zinc that she was briefly startled when she opened the door to her casita and was immediately charged by two dogs, her dogs, Paddy and Orlando. Paddy was six years old and appeared to be mostly golden retriever with some chow mixed in—a furry yellow dog with a black tongue that was always hanging sideways out of his mouth. Zinc had found him at the end of the dirt road that led to the property when he was a puppy. He was half starved then, and the gash on his leg indicated that a larger animal, probably a coyote protecting her pups, had tried to warn him away. (If a coyote had really wanted to hurt him, it would have gone for his throat, and given his size at the time, Paddy would not have survived.) Paddy was sweet and intelligent, but he was also suspicious when there were strangers about, generally up at the old man's house as Zinc didn't get visitors herself. Orlando was a beagle mix, about four years old. He had come from a shelter just over two years ago. This was back before the old man's legs had gotten so bad, back when he could still get around with a cane on one side and someone's arm on the other. He'd heard that his neighbor's dog had run away, and since the neighbor was in worse physical shape that he was, and didn't have a driver to chauffer him around, the old man volunteered to have Smith take them both to the shelter to look for the Doberman, Gilly. Gilly wasn't there, but the old man saw Orlando dancing at the bars of his cage, and he imagined that the beagle would be the perfect companion for Paddy, that Paddy might relax if he had a younger dog to play with. So he brought him home and told Zinc if she didn't want him, or if Paddy wouldn't tolerate him, it wasn't a problem; the shelter would take him back. But both Zinc and Paddy fell in love with him immediately and that was the end of that. Once she had greeted her dogs, given them each a biscuit and let them out, Zinc let the "under the radar" remark go down the drain, literally. It was a trick her father had taught her when she was a child (back in rural upstate New York, a couple hours north and west of New York City) and would come home crying because someone had teased her or called her a name at school. He would drag a wooden bench over to the kitchen sink and have her step up on it. Then he would turn on the faucet and Zinc would repeat the words that had hurt her so ("weirdo," "mute," "witch eyes,") and together they would wash them down the drain. They had done this so many times and with such zeal that both believed that they could "see" the insults swirling drainward. "Go play, now," her father would say, and she would, skipping outdoors, her curly brown pigtails flying out on either side of her head, calling out her brother's name, Frankie, Frankie, who, her father hoped, would watch after her after he and his wife were gone—because a sixth sense told him they would never reach old age. Zinc had been working for the old man and living in the casita behind his house for twenty-five years now, since the year after her parents died, the same year Steven left, and she did not love the place any less. It had been built over one hundred years ago, from adobe. Although it had been upgraded with central cooling and heating, Zinc seldom needed temperature control. The adobe stored and released the heat slowly, keeping her little house cool in summer and warm in winter, except when the temperatures were extreme. It was almost as if she were living in something that was alive itself. Her little casita was beautiful in its simplicity; all the walls were painted a warm white and all eight-hundred square feet of flooring was covered with a red-gold Mexican saltillo tile. Her furnishings had all come from the old man's house over the years, odd pieces that he no longer needed, and all of it was Mexican as well. And then there was the art. The old man was a collector, and each time he brought new paintings into his house, he would pass the old ones on to Zinc. His daughter, whose name was Marge, liked to carry the smaller ones over herself, probably, Zinc thought, so that she could remind her each time that some of the paintings were of considerable value and that Zinc must never never come to think of them as anything but a loan. As if Zinc could ever forget that. Zinc did not have a land line or a cell phone. She did not have a TV or an MP3 or an iPod or a digital camera. She had a radio. And she had a computer, now two of them, and while the new one was modem-less, the Internet that worked through her desktop model had become her connection to the world. She had even made a few friends over the Internet, most of them editors of literary magazines who considered—and sometimes accepted—her poetry for their quarterly or biannual publications. She opened her new used laptop on the kitchen table and plugged in the charger. In addition to the Word program that she planned to make good use of, there were a half dozen others. She was delighted to see that one was a chess game, and that you could "zoom" it up to be the size of the screen. She and the old man played chess all the time. She couldn't imagine playing chess with a computer herself, but the old man might enjoy it. He got so lonely sometimes. And now his eyes were so bad that he could no longer read. She read to him frequently, but never for more than an hour at a time, because she was prone to sore throats. He listened to audio books, but he said it wasn't the same. They made him sleepy. He hated to sleep, because he had nightmares much of the time. Zinc thought he must have read more books in his life than any ten people she knew, not that she actually knew ten people. He could remember everything too, even information from books he'd read back when he was quite young. Although his tastes ran toward histories and biographies and hers toward fiction and poetry, they could spend hours talking about books; they could spend hours talking, period. While the computer charged, Zinc heated leftovers from a casserole she'd made for the old man the evening before: artichoke hearts, spinach and chicken tenders. She called the dogs in and fed them and let them out again. When she finally allowed herself to look at the digital indicator on the computer screen, she saw that the charging had progressed only to fifty percent of capacity, but it would have to do. Zinc pulled out the cord and closed the laptop and hurried out of the house. Her breath caught immediately and she stopped in her tracks, the laptop crushed to her chest. There was a moment every evening when the setting sun was exactly opposite the mountains, and if one were lucky enough to catch it, one could see the Sandias (sandia meant watermelon in Spanish) turn pink. Not just light pink, but if conditions were right, shocking pink, a kind of otherworldly fuchsia that made the heart pump faster. Almost as soon as it began it was over. The mountain turned gray and the sun was on its way again, descending over the volcanoes to the west. The spectacle moved Zinc to run, something she did occasionally when no one was around. Orlando and Paddy, who had been resting together under a pine tree, saw her and rose simultaneously to join in the fun. With the dogs at her heels, Zinc ran across the yard, along the slate path through the garden, and started up the slate stairs. The stairs were beautiful. The old man had built them himself, years ago, back when his wife was alive and his children were young. They were encased in stone and featured stone risers. He had gathered the stones himself, from multiple hiking trips taken into the mountains with his loved ones. Zinc was almost to his door when the toe of her leather sandal caught and she fell forward. Of course she had to drop the computer to keep from landing flat on her face. She sat up and immediately burst into tears. Her new computer—which had cost her two trips to town and half of the money she'd saved in the glass jar she kept on top of the refrigerator—had to be broken. There went sitting outdoors facing the mountain. There went who knows how many poems about coyotes, about jack rabbits running through the brush. Orlando licked her. Paddy moaned as if he knew exactly how she felt. The door opened slowly beside her. She looked up expecting to see the old man looming over her. She always praised him when he came to the door with his walker instead of waiting in his wheelchair for her to open it herself. He needed more exercise. He was a small man now, the size of a twelve-year-old boy. He suffered from, among other things, kyphosis, a hunched back. A very hunched back. It made him look like a troll. But it was not the old man's troll face that Zinc found herself staring up at. It was his daughter, Marge. "What are you doing on the ground?" she asked impatiently, in a shrill voice. "And why are you crying? And where were you this afternoon?" Zinc got up slowly, lifting the laptop from the slate as she did. She could feel movement, things inside slipping around. She glanced over her shoulder at the driveway. Usually when Marge was there she parked out in front of the house, where a delivery person might park—which made sense because she never stayed any longer than a delivery person would. Now Zinc saw that Marge's car was beside the workshop. She could see the bumper of the dark red PT Cruiser. If she had known Marge was there, she wouldn't have run across the yard, and then she wouldn't have dropped and broken her new computer. "He's all right, isn't he?" she asked. Marge folded her thin arms beneath her small breasts. "No," she snapped. "He's not all right." She looked upward and took a breath. "He took a fall. Down the stairs. Right here. Where were you all afternoon, Kathryn?" "What do you mean, he took a fall? How?" Marge unfolded her arms and thrust them out, exasperated. "He must have been feeling badly. I don't know. He must have wanted something. He must have tried to get you on the intercom and then gone outside to see if you were in the yard. And he must have tripped." She took another swallow of air. Her arms fell to her sides. "Peter found him. He's dead." Peter Welsh, the handyman, had worked for the old man for over thirty years. He kept up with repairs on the house and the casita and maintained the gardens. These tasks took up about half a normal workweek, and, as his wife always reminded him, he could easily have taken another part-time job to fill the other half. But he didn't. She made a good salary, and she even had an inheritance from her mother, money to tide her over in old age. So he didn't know what she was so worried about. As for him, he had other plans for getting through old age, if he even lived that long. But now here was a problem: The old man was dead. He hadn't even told Anne yet. He was saving the news for morning, when she'd be rushing to get ready for work and there wouldn't be time for any discussion. Peter was a heavy drinker. He started at dinner each evening with a bottle of Corona and continued on until he fell asleep, usually on the sofa in front of the television, some eight or nine or ten bottles later. Anne liked to say it'd be easier—and cheaper—if he took it intravenously, out of a barrel on a dolly, so that he could drag it around with him—not that he moved much once he got started. He was near passed out the night of the old man's death when he heard someone knocking lightly on the door. He and Anne, who almost never had unexpected visitors, looked at each other. Then, simultaneously, they looked at the large sunburst clock that hung on the faux wood paneling over the TV. It was almost ten. Anne had been knitting a blue and white blanket for a colleague's new grandchild. She placed the needles and yarn on the floor beside her feet. "Who on earth...?" she asked in a whisper as she slid to the edge of her chair. "Get it," Peter said, turning down the volume with the remote and sitting up. "What if...?" Anne began. She had worked in the ER for years. She knew better than most that opening the door this late at night could have adverse consequences. "Just get it," Peter said testily. She was full of fears. What if this and what if that. It drove him crazy. Anne got up and moved to the door. She pressed her face up to the crack, so that there was only a snake of weather stripping between her and the visitor—or visitors. "Who is it?" she asked tentatively. A woman's voice responded. But it was so low she couldn't make out what it said. "Who?" she asked again, louder. Peter, who had recognized the little girl voice, was on his feet. He elbowed Anne out of the way and unlatched the door and threw it open. And there was Kathryn, the old man's caretaker. Though they lived a half a mile apart, she'd never come to his door before. "What do you want?" he said as if she were some pesky child. "I'm sorry," Zinc began. "Marge said you found him. I had to know—"
"What? What's happened?" Anne cried looking over her husband's shoulder. "Has something happened to—"
Peter stepped outside and quickly shut the door behind him, cutting her off. He held onto the jiggling knob. "I found him, yes," he said briskly. He looked at her mutts, the big gold one and the little beagle, flanking her on either side. Then he cocked his head, so that they were more or less eye level. He couldn't help but smile. He thought her eyes were beautiful, like the eyes of some strange animal. He'd had a horse once with silver eyes. That was a long time ago, back when he was a boy, back when so much of Albuquerque was horse country and the people from the coasts hadn't yet invaded and ruined everything with their cookie-cutter houses and their fear of open spaces. The old man had kept horses too, four of them, but by the time Peter had come to work, he was down to one. Egg. His favorite. Peter drifted off into memory, the sound of Egg's neighing that night.... He shuddered. "Can you tell me what happened?" Zinc pleaded. "You're coming here at this hour to ask me what happened?" Peter asked indignantly. "I...I saw the light was still on and...."
He could see she was terrified of him. He knew she was a bit strange. Like Anne, she had no chutzpah whatsoever, but he suspected it went deeper than that. "I only found him," he said at last. "What exactly happened to him that caused his death, if that's what you're asking, is not a question I could answer." Zinc looked down at her feet, barely visible as neither Peter nor Anne had thought to turn on the outside light. "I meant," she began, and she took a deep breath. "I meant, how did you find him? Did he say anything or was he already...?" Peter sighed and rolled his eyes impatiently. Dead was dead; what did it matter? The old man was...well, old. Very old. Did she think he'd go on forever? But then he pictured the way it had been, the shock of seeing him out there, lying across the step in the noonday sun, and he had to close his eyes and regroup for a moment in spite of himself. "I was in the shop putting tools away," he began. "When I came out, I noticed something laying across the stoop. I thought it was one of your dogs, stretched out in the sun there the way they do sometimes. But as I looked, I realized it was him. A bag of bones, he looked like. Maybe he hit his head, although I didn't see any blood. The kitchen door was open behind him and his walker was right there, so maybe he took one step out on the stoop holding on to the doorknob for balance and the door swung too far. I wouldn't know for sure. That's all I can tell you." "I didn't touch him. Not part of my job. Marge was in the house, so—"
"—so I yelled out to her. When she saw him on the stoop like that, she told me to go down and get you and call an ambulance. So that's what I did. I knocked on your door, but you weren't there, so I called an ambulance from my cell. It was the ambulance guy who said he was dead. Otherwise I wouldn't have known for sure. I didn't stick around. I left after that." "Marge was there," Zinc whispered half to herself. He stared at her. He could see that she had gone far away, seeing the scene the way he had described it. "What're you going to do now?" he asked. Zinc looked at him, as if trying to make sense of the question. Then she shrugged. In the quiet of the moment they could hear Anne crying softly behind the door. Peter shook his head slowly from side to side and rolled his eyes again. Then he turned his head slightly to scratch behind his ear. Zinc mumbled a thank you and turned, her shoulders sloped, her head all but dangling from her neck. The dogs followed solemnly behind her. He watched her go. She was a strange one. He watched until the darkness swallowed her. He wondered what her eyes would look like caught in someone's headlights, whether they would shine the way an animal's do. He was certain she would stop in her tracks the way an animal would, stunned, arrested by the light. Picturing her eyes shining in the dark was arousing him. If his wife wasn't standing there behind the door blubbering for no good reason, perhaps he would have grabbed a flashlight and gone after her—just to test his theory. The words floated in Zinc's mind, but they were like a clump of dirt colliding with a log—the larger, more solid fact of the old man's death—and quickly disintegrating only to regroup again later. Zinc could not get over it. Of course she knew the old man could not live forever. He would have been ninety-four in another month. But still it seemed so unexpected. Except for the terrible crippling arthritis and the Parkinson's, both of which he'd had even a quarter of a century ago when Zinc first came to work for him, he wasn't all that sickly. He was just old. He'd been old since she'd known him. But he'd taken good care of himself, after a fashion—though except for the checkups she insisted he have biannually, and Levodopa to minimize the effects of the Parkinson's, he stayed away from western medicine as much as possible. His brand of medicine was Emmaline, an old half Mexican half Ecuadorian herbalist who lived in a cabin up in the Manzano Mountains. About once every three months he had Smith take him up there, usually on a Sunday morning. Then Smith was dismissed with the directive to pick him up the following day. In the beginning, when the old man first told Zinc about Emmaline, she pictured that they talked first to identify his ailments and then went out to her garden, the old man using her arm and his cane to get around, or even out into the woods, and picked the herbs that she felt the old man needed. Maybe the herbs made him sick initially, and that was why he stayed over. Or maybe she needed to keep an eye on his reaction to them. But now, curled up in a ball on the sofa with a colorful hand-woven Indian blanket over her shoulders and Paddy keeping her feet warm with his full weight, Zinc began to wonder if there was more to it than that. Once, when they had been playing chess, the old man told her that Emmaline was clairvoyant. For example, he said, she always knew when he was coming. Her house was at the end of a winding mile-long pot-hole-ridden dirt road surrounded by piñon and juniper. As Smith and the old man came around the last bend, they would always see her standing out there—or Smith, who had better eyes, would. Each time Smith would shake his head and marvel, "There she is, right on schedule." Zinc remembered that the old man had been about to castle when he told her this, but then he put his king back down and looked right into her eyes and said, in his old quivering voice, "It's always disconcerting to see her standing outside like that. It's..." He broke off to pick the right word, something he did much of the time. "...electrifying, somehow." He shuddered. Then he picked up his pieces and completed his castle. Zinc didn't like to contradict him, but finally she forced herself to ask, "Is it possible she just hears the car approaching?" She dropped her eyes to the board immediately, studying it to see whether it would make sense for her to castle as well. In a dreamy voice the old man answered, "Once last summer, Smith and I drove all the way up there and she wasn't waiting outside. Smith thought maybe she was out behind the house somewhere, or out in the woods, and that if we waited a while...but I said, No, Jason, if she's not here then she's not home. Because I knew by then how intuitive she was. The next week I had him take me up again. I couldn't call, because she doesn't have a phone. And this time, she was out in the driveway as usual. And the first thing she said to me, in Spanish, through the open window, before I even got out of the car, was, 'My son came from Juarez to get me. His daughter had a new baby and they wanted me to give her my blessing. I tried to make you know, but you didn't and you came anyway. You need to learn to listen.'" When Zinc had completed her move, pushing an end pawn instead of castling, the old man said, "You're a bit like that. Like Emmaline." The old man leaned his head, which sometimes wobbled quite badly, into the palm of his hand. "Well, I guess I was thinking 'reclusive' more than 'intuitive.' Sometimes I think it's wonderful that you seem to have everything you want right here. Other times I want to shake you, gently of course." He smiled. "Sometimes I want to tell you that there is so much more out there in the world, if only you would.... I think to myself, if she were my daughter...." The old man drifted. His smile faded and his eyes grew sad. Then he seemed to come back from wherever his thoughts had carried him. He dropped the hand that had been steadying his chin and looked at Zinc very deliberately. Zinc had no idea what to say to him. There was no three- or four- or ten-word phrase that would sum up what she wanted or didn't want in life. It was just how it was. The old man must have seen that he'd embarrassed her, because he reached out one cold, feeble, shaking, age-spotted hand and gently tapped one fingertip on her hand, which rested to the side of the chess board. "Is it my move?" he asked, and they both returned their attention to the game. Now he was gone. They would never play chess together again. They would never sit in the old man's kitchen—with its handmade rustic pine cabinets and his collection of colorful paintings of beautiful Chicano women holding babies or gathering sunflowers—to talk about books, or politics, or sometimes even just to gossip. Both Zinc and the old man had always appreciated a good story, whether it came from a paperback or from the lives of one of the neighbors, or even one of the other people who worked for the old man. Take Peter. The old man had told Zinc that Peter, the handyman, had lost a child years ago, when he was still with his first wife. It had been a terrible accident. They didn't get much snow in Albuquerque, but that winter they had a good storm, eight or nine inches, and the child, a boy, who was not quite three, was so excited that Peter fashioned some kind of makeshift sled for him—replete with a harness to keep him from falling off—and tied it to the back of Scott, the chocolate lab he'd had at that time. Scott was a good dog, an older dog, and there was no reason to think that he wouldn't walk right beside Peter out on the side of the road. But a pickup with chains on its tires went by, and in its bed were two German Shepherds, both barking for all they were worth, snarling and snapping their teeth like it was Scott who was trespassing on their turf, and for the first time in all the years since Peter had owned him, Scott bolted and took off after the truck. The little boy fell backwards on the sled, his head hanging off of it, bouncing along in the snow, and by the time Peter got the dog to stop, the boy was unconscious. Peter did away with Scott as soon as he and Angela got back from the hospital—shot him through the head with his hunting rifle, outside between two snow-covered cars in the lot behind the apartment building where he lived at the time. After his son died (following three long weeks in a coma), he made an attempt to do away with himself too: pills, but apparently not enough of them. He wound up in the hospital where Anne worked as a nurse, and they started an affair, and the rest was history. Peter had never been likable, but the old man had hired him anyway because he knew his story. That was the value of a story, the old man liked to say. Everyone had one, and once you knew what it was, you made allowances; you did what you could to give a sad story a better ending. And to that purpose, and even though Peter's personality had not improved over the years, the old man had even sold him the house that he and Anne now lived in, for a very fair price—and against Marge's better judgment. As for Smith, the old man's sometimes driver (he had other work freelancing for a turquoise company; he liked to refer to himself as a "rock hound"), his story was that he had hurt himself badly at the age of eighteen with a chainsaw. The chain just snapped while he was in the process of cutting up an old cottonwood that had fallen behind his mother's house up in the North Valley. When the chain popped, it hit against his chest, diagonally, and while it didn't slice into any of his organs the way it could have, it cut through his skin, and the scar it left, the old man said, was so pronounced it looked like he was wearing a Bandolier bullet belt. It was a miracle he had survived. Smith, who couldn't have been more than thirty years old, said it didn't bother him, but the old man felt it was the reason he hadn't had a girlfriend in all the time he'd known him, that he was afraid the scar would scare the women away. Zinc's scars were nothing by comparison. She'd always been a quiet girl, an introspective girl, and she'd gotten through grammar school and high school by minding her own business and keeping a low profile. At the university, though, living in a dorm, keeping out of the limelight became more difficult. Every day, it seemed, something happened to remind her that she was an oddball, that she didn't quite fit in. Her teachers generally loved her, once they got her first paper. They were willing to forgive the fact that she didn't say a word in class, that she was awkward, that she hunched over a bit when she walked. But the other students could care less that her papers were astute and full of passion. They didn't laugh at her to her face like a few of the meaner kids had in high school; they just stayed away. And every now and then she would hear something whispered, usually someone saying something about her eyes, saying that she was scary looking, speculating that maybe she was a witch, or a wolf, or a werewolf. Once someone said she looked like a vampire. Zinc moved from New York (she'd been at school in Albany) to New Mexico, where her brother Frankie had settled, and spent what would have been her senior year of college living at Frankie's house. He provided her with room and board and some pocket money in exchange for keeping his books at the auto repair shop he was leasing at the time, and also keeping his small home tidy and his laundry clean. But it was never a good arrangement, Frankie and Zinc. And when she saw the ad the old man had put in the paper, seven lines of the most beautifully written text she had ever seen in the classifieds, the old man's kindness so evident in every word choice, she decided that she would become a "companionable housekeeper." And somehow twenty-five years had gone by—a quarter of a century. Zinc's gaze moved to the kitchen area of her casita. Like the old man, she had hung his excess of paintings of Chicano women performing domestic tasks in the kitchen, on the wall behind the pine table. The table was the old man's too. Everything was his. In a sense, she had created her life with his surplus. She looked at the sink. Even though she was still curled on the sofa with Paddy lying on her feet, she could envision the basin. It would be clean, spotless; she never left dishes in it. The chrome drain strainer would be free of food scraps. But there was no point in trying to wash the old man's death down the drain as she had done all her life with smaller matters. It would be an insult to even try. Instead she let her eyes drift from painting to painting, taking in all the ones she could see from her vantage point, all artwork that the old man had chosen himself over the years. Much of it he had bought when he was younger, from China, Japan, Indonesia, places he had traveled with his wife. The later stuff, the stuff that he'd bought after his wife died, thirty or so years ago now, was all from Santa Fe or Taos. Folk art. Indian Art. Still lifes. Landscapes. Every medium. He had simply always bought what he thought was good, what he liked. Every time he and Smith returned from a trip with a new piece, he would set it on the counter in his kitchen for a few days, or on the floor leaning against the lower cabinets if it was large, where he could study it until he decided where to hang it. When Zinc came up to the house, she would study his newest acquisitions with him. With the old man, Zinc could be at ease saying nothing. They could just sit together and look, and if she didn't like a piece as much as he did, she could get up and begin to clean or get his lunch together, and that was fine too. On the other hand, sometimes her comments about his paintings led to conversations that would go on and on for so long that she would almost forget that she had come to clean or to prepare a meal in the first place. Not that he told her very much about personal matters. He was a private man and she respected that. And since she was a private woman, it worked out fine. What she knew about the tragedies in his life—which wasn't all that much—she knew from Smith, who knew from his mother, who had gone to grade school and high school with the old man's children years before. Once Zinc came in to find a painting of a herd of wild horses on the kitchen counter. This was back before the old man's legs were so bad, and so he was not sitting but leaning against the counter opposite, with his arms folded over his chest, staring at it. The horses in the painting were galloping along on a path that cut through a pine forest. One shaft of sunlight had managed to break through the boughs of the trees overhead, and it fell on one particular horse, rendering him—or her—otherworldly somehow, mythic. Zinc recalled how a conversation about that shaft of sunlight had somehow become a conversation about soft-boiled eggs. Now for the life of her she couldn't remember how that had happened. One minute they had been talking about sunlight and the next he was near tears, and when she asked if there was anything wrong, he stared at her for a long moment, then said his mother had cooked the most perfect soft-boiled eggs.... And how he'd loved them as a little boy—one egg with one slice of toasted white bread and a banana on the side that he could either eat there, at the breakfast table, or shove in his back pocket to eat while he walked, or ran, to school. That painting was actually in Zinc's casita now. She forced herself up on one elbow to have a look at it. It was hanging in the hall that led to her bedroom, in an arrangement with several other pieces. Forty-five; there were forty-five of the old man's paintings in her house. She had counted them a few months ago, and she remembered the number because it was the same as her age. The pain was almost unbearable. How could Zinc have thought that she could stand it? It would have been so much better if she had forced herself to stay in the world, if she had never come into this perfect microcosm of a perfect world, a place where a woman like Zinc could easily live. A place where you could know that the ocean was filling up with oil, and now with radiation too, and that the country was on the verge of financial disaster, and that politicians cared more for their status than their constituents, and that people were starving all over the world, fighting all over the world—but you could also close the door on that which you couldn't change—the way you might close the door on street noise or fighting neighbors—and enjoy some peace of mind...your piece of mind, the old man liked to quip. Zinc got up from the sofa suddenly, with a flourish, tossing aside her blanket and startling Paddy, who looked at the door and barked once, thinking she had heard something he'd missed. Orlando, who'd been curled up on his doggie bed right beside the door, got to his feet and stretched, first with his head up and his backside down, extending one short leg, and then the reverse, like a seesaw. Zinc walked quickly to the kiva-style fireplace and retrieved a notebook and a pen from the banco at its side. Tears were running down her face. She'd been crying on and off for hours, ever since she'd heard the news. She climbed back onto the sofa, propping herself up against its arm with her knees up in front of her. Paddy crawled toward her to be closer, curling up again on her bare feet. Orlando crossed the room and jumped up on the end of the sofa and immediately closed his eyes. At first Zinc just made marks on the page, little designs that looked like upside-down opened umbrellas, something to catch her tears. Then she wrote "Thomas Quickwater," the old man's name. Then she wrote, The moonlight sitting on the old man's shoulders like a cloak, he stole away to the mountain.... And before long she had written a poem, utterly silly really, a bad imitation of Wordsworth's "Lucy poems" perhaps, about the old man, Thomas Quickwater, and the medicine woman, Emmaline, who, she imagined now, had become his lover after his wife died. Despite the fact that she'd been up half the night crying, Zinc awoke early, when the light began to pour through her curtainless windows. She was surprised to find herself fully dressed, in the same black sweatpants and moss green V-neck T-shirt she'd worn yesterday, and curled up on the sofa. It only took a moment for her to remember that the old man had died, that that was why she hadn't been to bed. She began to cry again, quietly. When she opened the door to let the dogs out, she saw Marge's car in the driveway. She was there already. Or maybe she'd stayed the night, though it didn't seem likely since she only lived across town. Marge had been there. That's what Peter had said. But her car had not been in the driveway where she usually parked. It had been on the side of the shop. Why had she tried to make it sound like it had somehow been Zinc's fault? Maybe Marge's words had simply been an empty accusation, the words of a woman in the throes of grief. Zinc remembered back to a time when she was a kid, back in New York. She had been at the home of her friend Nancy, playing Scrabble, when a man knocked loudly on the door and told Nancy's mother that her other child, Nancy's brother Jeff, who was a Little Leaguer, had just been hit in face with a baseball bat and that an ambulance had already been called. The stranger, who turned out to be one of the coaches, told Nancy's mother to grab her bag, her jacket, whatever she needed, and he'd drive her to the hospital. As the frantic woman ran from room to room collecting her stuff, she mumbled to herself, "Why my Jeff? Why him?" in a manner that made Zinc think it would have been more tolerable for her if it had been Nancy who'd been hurt. Zinc remembered how badly she had wanted to comfort Nancy, who sat at the table as stiff as their game board, but she had no way to know whether Nancy had understood the implication, and she certainly didn't want to be the one to suggest it to her. And as time passed (Jeff survived with nothing more than a broken nose), she began to wonder if she was the one who had misunderstood. Was it possible that she had misunderstood what Marge had meant as well? Zinc wanted to recall their conversation verbatim, but she didn't want to do it now. Her head was so heavy and murky that she felt as if she had a hangover, a phenomenon she hadn't experienced in many years. She poured some water into a kettle and put it on the stove to boil for tea. Then she went into the bathroom and washed up. Since she figured Marge would have her at some task all day—probably cleaning the house for the post-funeral gathering—there was no sense in showering until later. She knocked, and though she had let herself into the house a hundred times, a thousand times, she stood now and waited for Marge to answer. She didn't have to wait long. It was only seven-thirty, but Marge threw the door open with such force that it actually expelled an exhalation. The expression on her face was not pleasant at all. Zinc took a step back. She half expected Marge to scream, "You're late." But she didn't. She said nothing. She merely glared for a few seconds. Zinc had planned to offer her heartfelt condolences, but it seemed impossible to do so while Marge was maintaining such an aspect. "I hope I didn't wake you," she said instead. "I thought you might need some help. Cleaning, or preparing the food." Marge closed her eyes, shook her head, and then opened her eyes again. "What are you talking about?" she asked as she opened the screen door and stepped out, forcing Zinc to take another step back. It occurred to Zinc that now they were both standing right where the old man had died. It seemed wrong to stand there. She shifted from one foot to the other, wanting to hurry away. "For the funeral. I assumed that—"
"Look, Kathryn, there's not going to be any kind of service at this time." Marge used her palms to push the skin up on either side of her face, right up to her hairline. "I can't deal with it. Okay? I can't put it together. I've just lost my father. Can you understand that?" "You don't understand. I said no." She dropped her hands from her face and spread her fingers out in the air between them. "No!" Zinc looked at her feet. Marge sighed then spoke through her teeth: "Look, I don't mean to be so hard. But think of it; I've just lost my father. And I might as well tell you this now. The house is going to have to go on the market." "I can help you get it ready," Zinc began. She heard the desperation in her voice and was ashamed. "No, Kathryn. The place is a mess. I mean, I'm not saying it's your fault. You did an adequate job keeping the rooms, but...." She threw her arms up in the air. "Down in the basement there's actually mold. Apparently there was a leak and nobody noticed. And closets. His closets are a disaster. Old newspapers, magazines, just a lot of crap, and cobwebs and.... I need to pack the stuff of value and put some in storage, and get rid of the other stuff and clean the place from top to bottom." She sighed again. Then she shook her head. "And I'll be needing to go through your place too." "How long?" Zinc asked. She could feel the tears welling up again. She breathed deeply for a few seconds, until she was sure she could open her mouth without emitting a sob. "How long do you think it will be until I need to be out?" Marge placed her hands on her hips and looked at the sky, pondering. Although one part of Zinc's mind was rooting for a date far in the future—three months from now, six months, a year—the other part could not help but notice what an attractive woman Marge really was when her expression softened a bit. Zinc knew the old man had had both his children—Marge's brother had died years ago—in his early forties, which meant that Marge was probably in her early to mid-fifties. She was a small woman, with short spiked grey hair. Her skin was pale and her eyes were a creamy blue; she had surely been blonde once. She was in excellent shape, for a woman of any age. Though she never discussed anything personal with Zinc, Zinc knew from the old man that she was an avid practitioner of Pilates, yoga, Tai Chi, Tae Kwon Do, Chigong and Hapkido. They had exchanged a smile when he first told her that, as if to agree that it bordered on folly to take that good care of one's body. But then, as if they both realized simultaneously that there was a mote of betrayal in their exchange, they both swapped their smiles for more somber expressions, but at exactly the same time, which made them both smile again. "I'd like to say a week," Marge began, tapping her lower lip with her finger, "but I guess that's not fair to you. I guess I can hold off two weeks. But in return, you need to promise me that you'll start looking, and if you do find something sooner, then I'd like you to let me know." "But I do need to get the artwork out of there as soon as possible," Marge continued. "Today is Sunday; let's say Tuesday in the afternoon I have Peter come by to start packing it up. There are forty-four paintings according to my list. It will take him probably Tuesday into Wednesday to do a proper job of packing them all." She sputtered a laugh. "You're probably wondering how I know that, the number. I've kept track over the years. Because, you know my father. He didn't keep track of anything." "Forty-five," Zinc mumbled, but Marge wasn't listening. "And maybe Peter can get some of the furniture out at that time too. Of course you'll need the table and a chair and the bed and so forth until you actually leave, but there are plenty of other pieces.... Kathryn, are you even paying attention to me?" 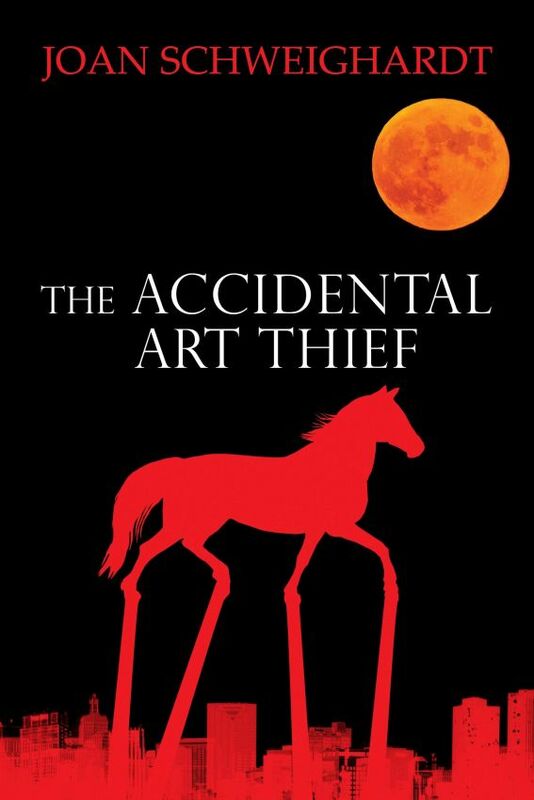 The Accidental Art Thief is Joan's fifth novel. Her previous work includes three novels published with The Permanent Press in the '90s and a historical novel published with Beagle Bay Books in 2003. The historical, called Gudrun's Tapestry, won Foreword and IPPY awards and was translated into Italian and Russian. Joan is currently completely her sixth novel, another historical, this one about the rubber boom in the Amazon in 1906. From 1999 to 2005 she had her own indie publishing company, called GreyCore Press. She was a one-woman show with no financial backing, and so when her distributor went out of business owing her a lot of money, she had no choice but to start wrapping things up. Nevertheless, one of the books she published (a book by author Julie Mars) was a BN Discover Great New Writers title and two others (a children's book by Dave Cutler and a memoir called ONE MAN'S LEG by Paul Martin) sold over 10,000 copies each. Pretty much all of the books she worked with won awards, including a Foreword Book of the Year for a book by Kate Niles, and many were translated into other languages. The Accidental Art Thief Copyright © 2015. Joan Schweighardt. All rights reserved by the author. Please do not copy without permission. "Zinc is an engaging, quirky, and utterly unique heroine, instantly likeable, with a hefty mixture of strong intelligence and overwhelming naivety.. While the novel is realistic, there is subtle magic woven in nearly every line, as coincidence and confusion come together into what might be termed the wisdom of time, spirit, and love." "Schweighardt populates her modern-day odyssey through the southwest with fascinating, quirky characters thrust into a complex (and hilarious) web of emotional turmoil, poignant misperceptions, and downright lies. As laugh-out-loud funny as it is thought provoking." "A sensitive, gripping, artfully rendered novel that kept me reading from the first page to the last." This page last updated 04-10-15.